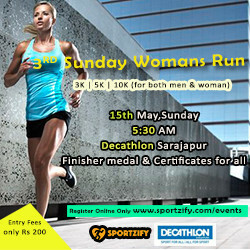 This run is dedicated to our women in Bangalore. Even Men and Children can participate. We have seen great turnout from women particpants of all ages along with some great men runners. Prizes - Certificates and medals for all participants. Winners get special prizes as well. Free breakfast for all participants. Bibs shall be collected on the spot and the route map shall be explained before the run.